An all-purpose database-driven development platform (Microsoft IIS, ASP & COM+ technologies, MS SQL Server, MySQL, Sybase, MS Access). A collection of mature programs that have evolved over 10 years. They work standalone or in conjunction with each other. Each component is compiled and compacted into a convenient setup program that you can download and evaluate in full version, with full documentation. A growing number of add-ons and customized solutions are for your choices. Always visit our news bulletin or sign up for updated features on the software. Real-time payments, real-time currencies, universal language capability (customizable to Chinese, German, Spanish, Japanese...). An application framework to fit into virtually any online business. Together they offer an enterprise-level, a multi-purpose, multi-storefront, B2B & B2C eCommerce Shopping Mall, which scales to millions of products. Configurable to sell any virtual and physical goods. Light budget for SMEs to own and run your own online system. High-end scalable to millions of products across multiple domains. A universal shopping cart program that can be added to any Web site/pages with a few lines of HTML codes. A feature-oriented and self-contained eCommerce tool that handles every aspect of online/offline sales (and after sales) within a shop manager. 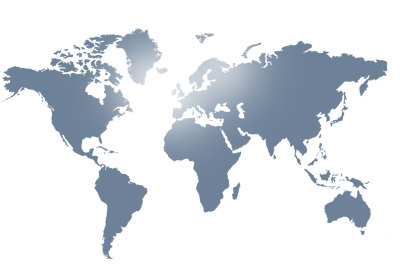 Interfaces with over 50 credit card payment gateways worldwide, and has an open interface to add your own. It can be customized by developers and translated into any language. Integrated with a state-of-the-art, point accurency GeoIP credit card fraudulence detection system, plus Triple-DES encryption for PCI compliance. Full packs of Advanced features such as real-time inventory monitoring, real-time shipping fee calculations, integrated coupon / gift certificate, paid online download / subscription, loyalty rewards points (through CyberClub), mulitple level volume discounts, etc. 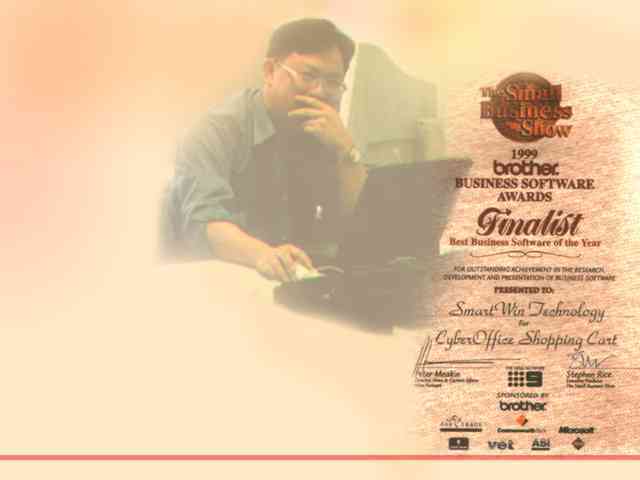 CyberShop was awarded the 1999 Brother Business Software Award Finalist (Channel 9 Small Business Show, Australia, Picture - Author and Award). A high-end online store builder that can handle millions of products. With CyberBuild, you configure and load your product data into an underlying database. The program takes care of the rest. Comes with a convenient storefront template, and a full Web-based backend management. Database level interface to any external systems (with full source codes), open database structure is fit into any business. Particularly powerful on handling large numbers of products. Great for an online warehouse when other similar programs would find it tough. Maintain a centralized database to serve any number of storefronts, on any domains, with each having its own look and store-level pricing markups. On-site Auction enabled as well as integrations with eBay, Amazon, Yahoo and more. Automatic billing and commission management system. Built-in reverse auction push market strategy brings buyers to sellers. CyberMall offers an enterprise level application that utilizes the full power of our core CyberOffice components. It provides a scalable platform on which you can implement your own B2B or B2C business. A flexible, function-rich online membership program. Works standalone or as an add-on to CyberShop and CyberBuild. Collect, profile and monitor customer information. Offers online registration, batch registration, restricted access, paid download, bulletin board, batch newsletter, membership payment, automatic renewal, royalty rewards, first-time buyer approval, order history lookup, affiliate tracking, referral crediting, link exchange, account-level pricing, & etc. Established eCommerce operator who is looking for new technologies to increase the sales. Our unique Virtual Franchise & Shopping Mall Builder is intended for this purpose. It is ideal for both business-to-business (B2B) and business-to-consumer (B2C) applications in any industries. Become a data/application service provider (ASP) to small business clients / retailers / distributors / franchises now! Small business / startup entrepreneur who manages own Web site and is looking for a straight eCommerce program / online storefront template. Look no further than our all-purpose online/offline shopping cart software with real-time inventory, real-time shipping rates, real-time payment facility, plus a membership program to organize and reward your customers or an online store wizard to present your products! Web/eCommerce developer, who is looking for reliable, scalable, trustful and Adaptable eCommerce packages / tools or online store builder. Yes our eCommerce software components are just what you need. Specify what you need for the project, then you simply configure our software to achieve the goal! ISP/Web hosting service who provides add-on eCommerce / shopping cart packages / online store templates to their clients. Yes, our software has been readily there for you from day one. We take every means to minimize the amount of management involvement from your perspective. We offer special server-wide licenses for hosting providers. Specialized industry where you have additional business requirements on your eCommerce. Our software provides such a platform or framework to put them on.